Yipikayay! It’s time to join the old boys in the west for some rootin’ tootin’ cowboy, train stealing online slots uk mayhem. Graphically speaking, this game has a cartoon and comic book aesthetic that creates a highly enjoyable gameplay experience. Join the gang and perform the greatest heist of them all in this online 5 reel bonanza. NetEnt has been maintaining its reputation as one of the best developers of slots game, by valuing quality, originality and simplicity. Their developers are always ready to explore a new theme and keep the player’s excitement and satisfaction levels through the roof. 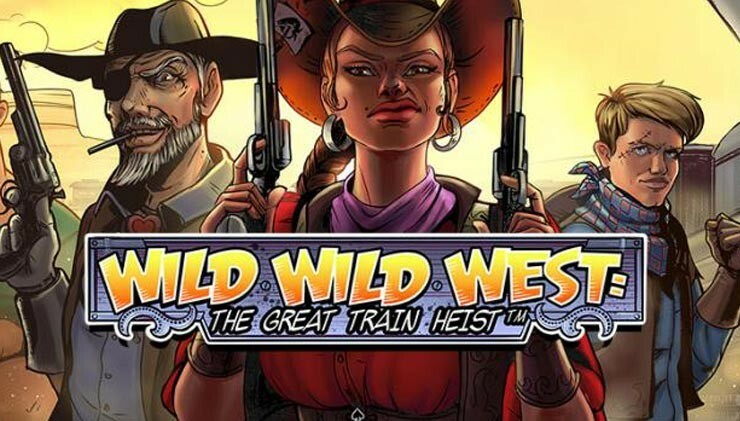 While Wild Wild West: Great Train Heist doesn’t take on a new theme, everything about its style, graphics and gameplay is uniquely thrilling and it will have you yelling “Yee-Haw” in no time at all. To see our EasySlots promotions please click now. There’s a great train robbery taking place in the Wild West, started by some of the most clever and cunning robbers anyone’s seen in a while, and surprise- you’re taking part too! Embark on this adventure and let the adrenaline take over, as you pull the trigger, steal valuables and then share them with your wild gang. And don’t worry, you’ll get your big share of credits when the reel starts spinning, so if you’ve ever dreamt of some Wild West action, now’s your chance. This slots game has 5 reels and 10 fixed paylines of intense fun, making the most out of this popular theme. The graphics are designed in a style similar to comic strips and you can tell attention has been paid to every detail- from the action filled music, to the authentic background and buttons and the features filled with rewards. You can bet anywhere between 0.01 and 0.50 credits and start collecting money as if you were a real robber! There’s plenty of interesting and personality filled symbols in Wild Wild West, as the reel is very visually pleasing. The most important one of the characters is the provocative and determined lady, who can bring you up to 500 credits if you spin 5 of her icons. The Wild symbol in this slots game is quite easy to spot, as it’s just the word written with comic strip specific lettering and it substitutes every other symbol besides the Scatter and Bonus ones. The 7 symbol is a Scatter and 3 or more appearing anywhere on the reel will activate up to 30 Free Spins. Each Free Spin will feature one of the random wild features: Regular Wild, Expanding Wild, Multiplier Wild or Spreading Wild, and they’ll bring you even more wins. Last but not least, a Pick and Click Feature will activate when you spin 3 Bonus symbols on the reel, but not during Free Spins. Then, the player can click on of the of the symbols and get a coin prize that ranges between 5 and 50 times your initial bet. You won’t want to stop the action in this 5-reel game, as the Wild Wild West will take over and the gang will make you one of their own, on the road to successful robberies. 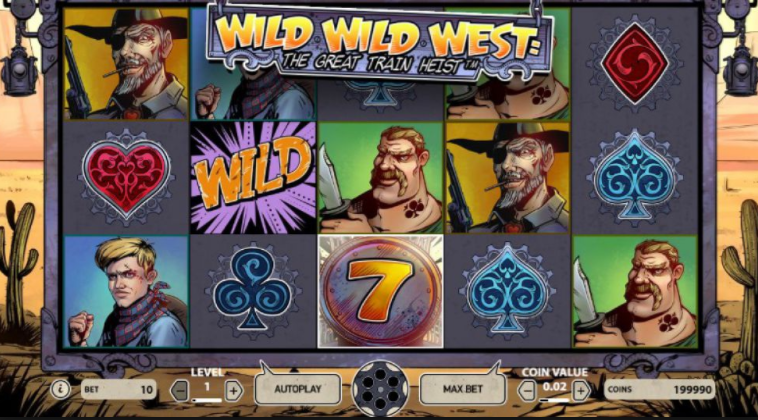 Wild Wild West: The Great Train Heist online slots game really is packed with wins and adventure, and the fun graphics are only one of the advantages of playing. You won’t be bored for a second and your pockets will be filled. An equally adventurous game is our Vikings Go Berzerk Slots.